I did something wild today. 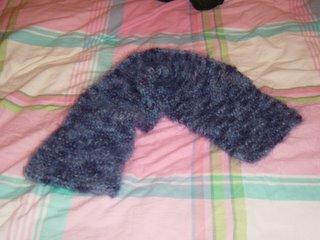 I wore the little mohair scarf I just finished this past weekend. Remember the horrible things I said about it? The itchiness? Too tiny? Well, I was wrong. I could wear it all day without looking like the silly girl who forgot to take her scarf off (yea for fashionability), it kept my neck warm and cozy without getting it too warm with its airiness, it wasn't scratchy once I wore it for a bit, plus it updated one of my very few work ensembles. I am the type of person to buy books and yarn over new clothes if the old clothes are getting by just fine. I am going to have to whip up a few more of these scarves to go with my other outfits. Today was also an exciting day at the post office. I got the books for my graduate psychology class I am taking, plus a few late "Christmas presents:" Mary Thomas' Knitting Book, Mary Thomas' Book of Patterns, Folk Mittens, and Folk Socks. Tomorrow I will have pictures of my knitting books openly accepting my new books into the flock. They have been chatting wildly about the Folk Knitting books (Folk Shawls has been particulary excited to see her brother and sister). This has been a fabulous weekend. I got an invite for a graduate school interview (hurrah! ), got the first season of Six Feet Under from the library, and got needles for 25% off at AC Moore. It doesn't get much better than that. Part of the reason this project finally took off was that I purchased metal size 2 needles. 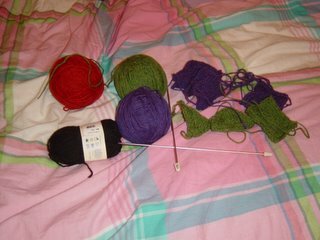 I generally prefer bamboo, but I felt that I was going to break the twigs every time I knited a stitch. Susan Bates is my hero. Success! 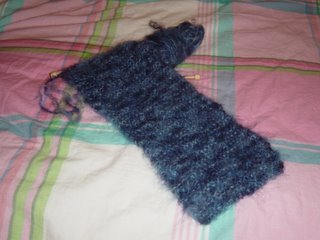 I finish my mohair scarf and it looks faboo! I still need to block it and hopefully I will be able get a couple of extra inches. A swatch would have been nice, but it's a scarf. Anyway, here it is. Now, for the answer you have all been waiting for! 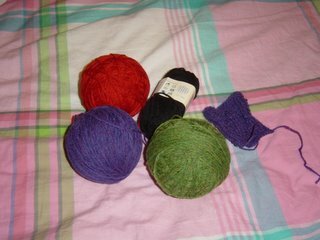 What am I going to knit for the Knitting Olympics? I must admit, I didn't really have a say when it came right down to it. 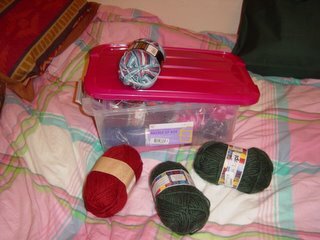 You see, tonight I decided to organize my stash (okay, really I just wanted to touch the yarn, but there was some organizing happening as well). Everything was going fine. 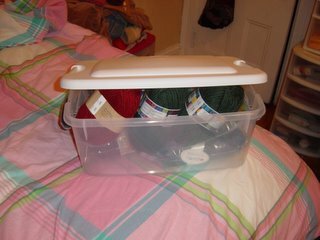 I reorganized the yarn and put it all back in my containers. This is where things got a little funny. The Magic Stripe yarn is peeking out too! Now maybe I didn't shut one container, but I definitely wouldn't have made the mistake twice! Of course, I didn't know it then, but I did make a mistake right then. I took my eyes away from the Lopi yarn. This was getting out of hand. 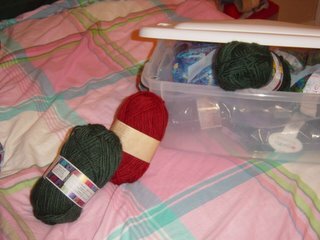 Where was the Lopi yarn going? That is when I noticed that they weren't the only escapees. The Magic Stripe yarn had escaped as well! All I could do was wonder what was going to happen now. I didn't like the looks of this. I should have said that the Knitting Olympics weren't worth it. There was just one problem: I couldn't look away. 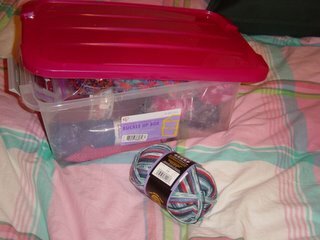 Magic Stripe yarn! I was so sorry it had to come to this! 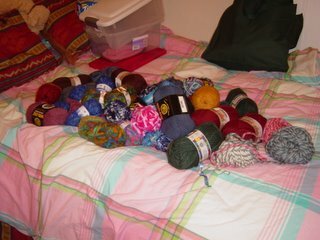 Looking back, I should always buy the same amount of every yarn type that way this sort of situation never happens again. I coudn't believe my eyes! That Matrix move was incredible. The Magic Stripe yarn is very springy (it's the nylon)! 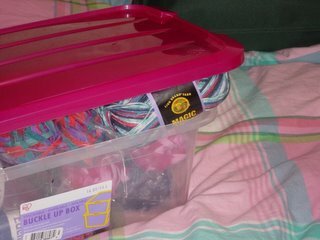 The Magic Stripe yarn did have a good lead, but the Lopi yarn is a pretty sturdy yarn (it can climb the tallest container). Well, I guess it is decided. 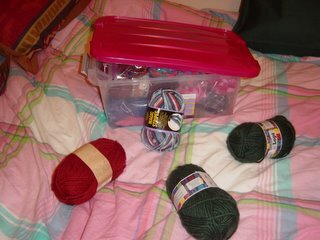 I am going to knit the Magic Stripe socks. It beat the bullying Lopi yarn AND it is now in my "Bag of Unfinished Things" (which was the other project I was thinking of completing for the Knitting Olympics). The situation couldn't be better. I will have more news (and pictures!) of my first blocking session ever this weekend. Keep your fingers crossed that all goes well. As I am sure many of you know, the Yarn Harlot has devised a marvelous idea of sorts...the Knitting Olympics. As soon as I heard about it, I immediately decided that I would make my first pair of socks...or at least a Christmas stocking (I won't need to worry about gauge or that second sock! ); however, a thought came to mind. : "Wouldn't it be lovely to finish all of your WIP?" 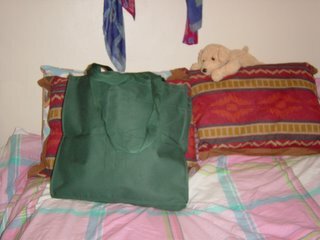 With this idea in mind, I tiptoed over to the "Bag of Unfinished Things." This is my little friend Nipsy (that was the name he came with and who am I to argue?) looking at the "Bag of Unfinished Things." Nipsy looks very scared and for good reason...behold...the projects! 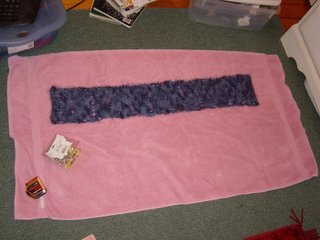 Item 1: Mohair scarf with eyelets that are impossible to see in this photo. I got the pattern from this book. I thought it would be quick about 150 rows. The problem is that my gauge isn't quite right. 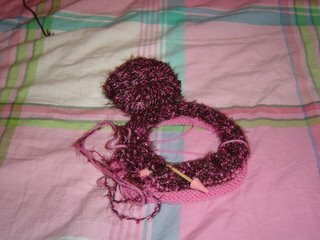 I shall blame it on the fact that I didn't use the same yarn. Anyway, I shall be doing a couple of more repeats of the pattern to get the decorative scarf around my neck. 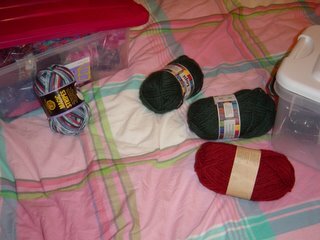 Item 2: This is the beginning of another scarf. I decided I wanted to get away from annoying mohair that is practically impossible to undo stitches when you didn't do the decreases just right and more on to a nice worsted weight textured scarf. I wanted a little seed stitch and a little basktweave and maybe a cable or two. Well, I did the opening seed stitch and...well...bluntly?...I just lost interest. 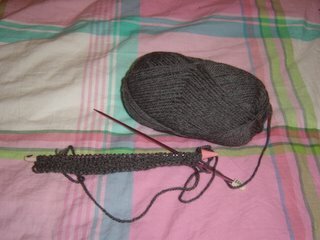 :( I think it was the sort of grey color...who wants to knit something that matches the horrible weather outside? Item 3: I had enough yarn to make two pink hats with this fun accent yarn. In fact, I made the first one and it looks darling. I started making the second one and I should have known I was not meant to make a second hat when I kept miscounting the stitches when I was casting on. I kept going though. I kept telling myself that I would perservere. Well, I dropped a stitch in the accent yarn and I have decided that perserverance in knitting could just mean starting a new project (I mean I haven't stopped knitting...that's good...right?). Item 4: Now this scarf holds a special place in my heart. 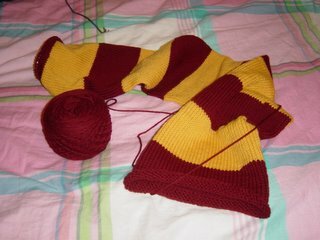 I must admit that once I saw a certain movie about a certain boy, I needed a scarf just like his. 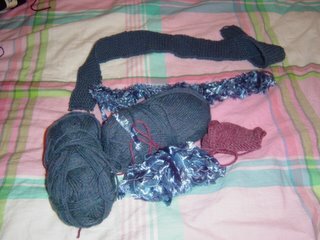 I love this scarf and making it; however, I was nervous that I didn't buy enough yarn and made half of it in two days. It might not look too long but I have knit about 17,000 stitches and, by jove, I need a break. Item 5: This project was started over a year ago. It is supposed to be a purse. Well, I got bored with the worsted weight plain yarn and decided to add a fun element to it. After knitting with the two yarns for a bit, I noticed two things. 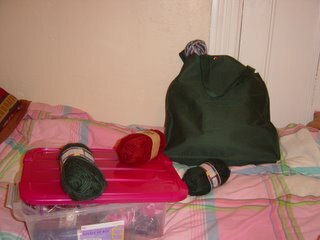 1) I didn't have enough of the fun yarn to finish the purse. 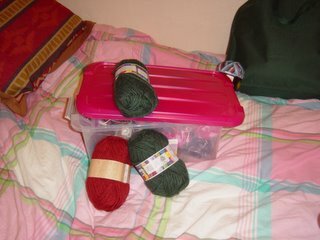 2) The fun yarn wasn't making the purse more exciting. Unlike the rest of my projects (which I have every intention of finishing), this one might end up in the swamp. Anyone else hear a frog? Riiiiip it! Riiiiiip it! Item 6: This is the saddest of the items. As you can tell only one itty bitty piece has been done. I would talk more about it, but it is a present and the person from whom it is intended cannot know what it is. Shhh!!! I will say though, this present must get done and reasonably soon too. I am a little scared about sewing all the pieces together. If you have seen my handiwork with sewing buttons back on (which promptly fall off again) and darning holes (which look worse afterwards), you would understand.